apan has suspended US long-grain rice imports after supplies were found to contain a genetically engineered variety that is unapproved for sale. The European Commission said it was seeking information from US authorities "with the utmost urgency". "Trace amounts" of the experimental rice variety were detected in US commercial supplies by the German company Bayer CropScience. Bayer then notified US officials about the positive test. The genetically engineered rice variety, LLRICE 601, possesses bacterial DNA that makes the rice plants resistant to a weedkiller. The strain is not approved for sale in the US, but two other strains of rice with the same genetically engineered protein are. 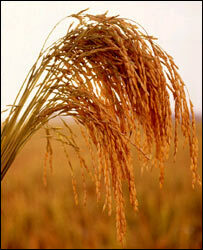 The majority of US rice imported by Japan is short- and medium-grain. These are unaffected by the ban. A spokesperson for the Japanese embassy in London said the ban would likely remain in place "until the US can say the rice no longer contains the genetically engineered variety". Antonia Mochan, a European Commission spokesperson for science and research told the BBC: "This is a matter of utmost urgency for us and we will be looking to act as soon as we can once we have the knowledge that can inform that decision." She would not rule out a suspension of imports, but said many options could be considered depending on the answers they received. In a statement, US agriculture secretary Mike Johanns said: "There are no human health, food safety, or environmental concerns associated with this [genetically engineered] rice." Friends of the Earth's GM campaigner Clare Oxborrow commented: "Bayer and the US Authorities must now explain how this has happened and release all available safety data to reveal what the risks are for consumers. "They must also urgently investigate the full extent of the contamination." Officials at the US Department of Agriculture (USDA) said the GM variety had been found in samples from storage bins in Arkansas and Missouri. The bins hold rice from several states, making it difficult to know what state the rice came from. Secretary Johanns said the US Animal and Plant Health Inspection Service (Aphis) was conducting an investigation to determine how the release happened and whether it broke USDA regulations.